All of us have probably experienced some form of "motion sickness". Maybe it was "seasickness" from riding a boat or ship, "airsickness" on an airplane, "carsickness" when riding on a car, or even after an amusement park ride. Is this a kind of illness? Many of us want to enjoy outdoors, going picnic or sightseeing, but because of motion sickness, you refuse to enjoy going out. Motion sickness usually occurs when having "sensory conflict", specifically a conflict between the eye and ear. When feeling motion but not seeing it (for example, in a car with your eyes focused inside the car), the inner ear transmits to the brain that it senses motion and the car is moving, but the eyes tell the brain that everything is still because you are focused within the car. As a result, the brain gets conflicting signals and will come to the conclusion that one is hallucinating and further conclude that the hallucination is due to poison ingestion. To clear the supposed toxin, the brain responds by inducing vomiting. Modern medical science can't find 100% remedy aside from medicine called tranquilizer. Here, I am going to let you know a very simple technique that can stop motion sickness for your happy weekend trip or vacation. Have a good or enough sleep before going for an outdoor trip. Avoid too much eating before you go. An empty stomach is not good either. Don't wear tight clothes. Loose clothing is preferable and more comfortable. Wear dark sunglasses to make your eyes less sensitive to flicker. Have you done the above techniques already? Then, follow below that is something different from what you knew. 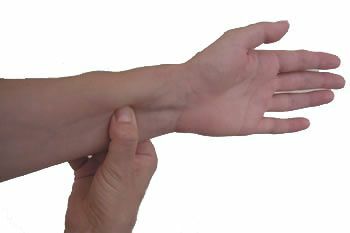 An acupressure point where you can press several times before and during your trip for relieving motion sickness or nausea is called "Neiguan P6 Acupressure Point". It's located in the forearm three finger widths below the wrist crease. Place your thumb on the point and press firmly while you breathe out, and release pressure as you breathe in. This will calm you down and soothe your stomach. Repeat if you still feel dizzy. This method is known in China for thousands of years in relieving many sorts of nausea. In Chinese herbal medicine, the use of ginger to prevent motion sickness is used. Ginger beer or ginger ale helps greatly. Ginger tea works the best. Do you notice that car drivers won't get motion sickness? Then, why do you get motion sickness? 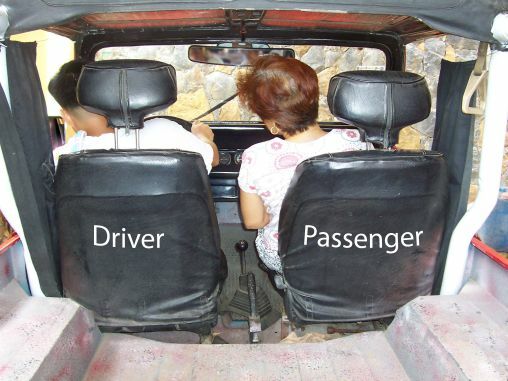 Do you also notice that when you are in the car your position is not the same as the driver? 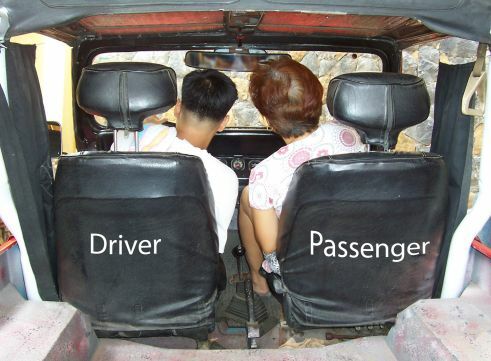 If the car turns right, the driver's body also leans to the right, but the passenger (you) try to get up or lean to the left just like the photo below. You should follow the movement of the driver. If the car turns right, your body should lean to the right, too, or vice versa. In this way, you will never get carsickness anymore. Therefore, the definite answer is not to stand against the force of gravity. Have a happy weekend or happy trip and a happy vacation with your family. Of course, there are people who get motion sickness due to some other kind of malady. Use the PYRO-ENERGEN :) .